Duquesne pharmacy professor Aleem Gangjee received five new patents between August and November for his research and discovery of cancer-fighting compounds and compounds that treat infections in AIDS patients. The newest batch of patents, four from the United States and one from Europe, join three active Research Project Grants (RO1) from the National Institutes of Health totaling $4.4 million. 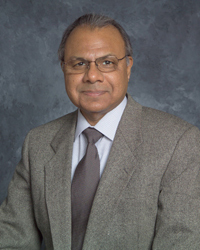 Gangjee, who started his research at Duquesne in 1979, has accumulated 29 patents during his tenure. Gangjee said his compounds are different from similar agents because they are selective. Drugs that are currently being used are not selective, meaning they cannot block or stop the growth of cancer without significantly affecting normal cells in the human body, which is, according to Gangjee, "one of the greatest drawbacks in the drugs that combat cancer." "Because the drugs being used right now are toxic, you can't give much of them. If you do, normal brain and body cells are attacked and killed," Gangjee said. "The normal agents don't work, but our compounds do." His compounds are also highly selective for brain tumors because "the compounds we have are extremely effective against brain cancer in animals." J. Douglas Bricker, dean of the Mylan School of Pharmacy, said Gangjee has found such success in patenting because his research is "sustainable, innovative and patient-oriented." "His research is contributing to the mission of the School of Pharmacy, which is to improve health outcomes for patients and their communities," Bricker said. "He's very close to a discovery that will have significant clinical application." Before a compound becomes available for public use, it must advance through a series of tests to assure it is non-toxic, effective against both infections and cancer and ready for human testing. Gangjee's compounds will be ready for human testing in five to seven years. Associate Academic Vice President of Research Alan Seadler said to obtain a patent, the researcher must first disclose the invented technology. After the Office of Research finds the researcher a patent attorney, the attorney works directly with the investigator to develop patent-filing and claims for the patent. Seadler said it can cost between $600 million and $1 billion to get a pharmaceutical compound to market, including everything from research to the actual release of the product. He added that "the bulk of the expense occurs during the drug development phase when the compounds are optimized and tested." With that aside, he acknowledged that the interest in Gangjee's new compounds "looks promising." "It's a long pathway forward, but we do have individuals specifically who are interested in his compounds," Seadler said. "The real question: can they raise the kinds of dollar necessary to get those compounds to market?" Since 1979, Gangjee has worked with graduate students from the School of Pharmacy to improve efficiency, a common practice among researchers at universities. The students, selected and ranked by the quality of their credentials, typically work with Gangjee for four to six years until they complete their degrees. "My proudest accomplishment so far is that every one of my graduate students are doing exceptionally well in their careers," Gangjee said. "Some have moved on to work for the major pharmaceutical companies. Some even teach in major universities."